The author is a Vietnamese Buddhist monk, born in 1926; he is active in the peace movement, promoting non-violent solutions to conflict. He has written more than 100 books, including over 40 in English. He is fluent in French, Chinese, Japanese, Sanskrit, Pali, English and Vietnamese. He is based in Plum Village in Dordogne in the south of France, and has established Buddhist facilities in Vietnam, France, USA, Germany. He is a Zen Master of Buddhism and a teacher of mindfulness (meditation). This book does a very credible job bringing the teaching of Jesus Christ in line with the teaching of Buddha. If these two men were to meet, one can suppose that they would have gotten along well. More on this below. Contact with the Holy Spirit is suggested to place one in a similar state of near nirvana to Buddhist mindfulness or meditation. In fact there are references to the benefits of mindfulness on nearly every page, and although Thich Nhat Hanh is a master teacher of Buddhist mindfulness, and he has written books on the subject, there is no prescription for reaching near nirvana. The author takes issue with the Roman Catholic church on its implied position that it is the only true religion. He makes the point that this can lean to real conflict and it inhibits constructive dialogue. I agree. While the ethos of Christianity and Buddhism may be similar, there are two important points on which the two diverge, Buddhists do not believe in an immortal soul; Buddha taught that the soul, like the body is constantly evolving and therefore impermanent. Thich Nhat Hanh says, “A good theologian is one who says almost nothing about God, even though the word ‘theology’ means ‘discourse about God’. It is risky to talk about God. The notion of God might be an obstacle for us to touch God as love, wisdom and mindfulness.” and “The Buddha was not against God. He was only against notions of God that are mere mental constructions and do not correspond to reality, notions that prevent us from developing ourselves and touching ultimate reality.” It seems to me that there are several problems with this. Christians believe that Jesus, as part of the Trinity, is God, and He is not a ‘mental construction’. 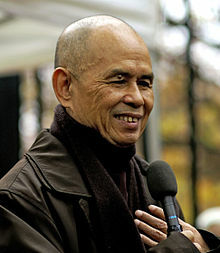 Thich Nhat Hanh seems to accept the reality of the Holy Spirit, also part of the Trinity; is the Spirit a ‘mental construction’? In the last sentence quoted above, the author uses the word ‘reality’ twice, without being clear about what ‘reality’ he is referring to. When I imagine a meeting between Jesus and Buddha, I don’t think it would be entirely friendly. In my scenario, Jesus chastises Buddha for being a ‘man of little faith’. For this reason, I found Living Buddha, Living Christ to be a book of little value: it focuses on relatively minor similarities while ignoring the important differences.